Happelsauce is written by me, Annie Happel, a world wanderer and seeker of all things delicious. I grew up in Seattle, but have lived in a smattering of cities across the United States. In February 2009, I created this blog as a means of keeping my family and friends informed of my experiences while working on organic farms in France and Spain. 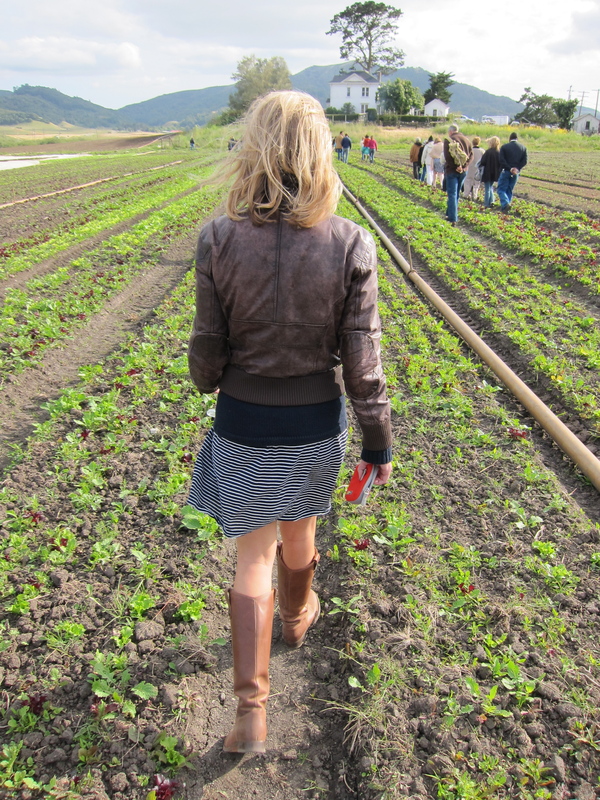 I found great joy in both farming and writing. Farming brought me closer to the earth – its seasonal bounty inextricably linked with freshness and flavor that gets lost in the season-less aisles of our grocery stores. Writing helped me to process my thoughts, reflect and shed light on my journey in an entirely different way. I returned to San Francisco in the summer of 2009 with a greater appreciation for the food I eat everyday and an insatiable urge to learn more and cook. Happelsauce is my outlet and my anchor while I learn about the origins of edibles and attempt to whip up lots of goodness in the kitchen. What a great start this sounds like. So far I am intrigued and inspired by Annie Happel’s posts on Happeltizer, and I am looking forward to following her travels. Don’t forget that many flowers are edible (as well as nice to look at and to be around) so I hope to see photos or thoughts you have on the gardens you come across abroad, as well as the food, and farms, of course. Good luck! El told me about your blog. Looks great! Naturally, I’m especially looking forward to hearing about France. Remind me to tell you some fun slang. amazing. inspiring and excellent writing. wow! Annie keep it up for more and longer than you want to — then come back and find a book agent. Annie, what a delightful website! I must visit more often. Your mom encouraged me to check out the Apricot Galette recipe, which I’ll very well bake tomorrow. It sounds yummy and looks lovely. Your writing is excellent! Miss and love you. Grammy sends her love from hot and muggy Tucson. Very cool, Annie! Can’t wait ’till I have a kitchen and can translate some of these recipes from the digital to a dish! Hi Cary! I just added a subscription link to the homepage so you can enter your email address and get updates every time I post. Thanks for getting Happelsaucey. Love you. It was nice meeting you at the Ferry Plaza Farm Market last weekend. Thanks for picking up a bottle of our farm’s Gravenstein hard cider! How about a blog entry on local cider producers and pairing food with ciders? Give as a holler if you’re interested. Hunter! I’m heading down to the market again tomorrow. Will you be there? Let’s discuss a potential post on cider producers and pairings. Hope to talk soon. Thanks, Madelaine! I use the Fresh & Clean theme on WP.com. It’s free! Hey, Annie. You may not remember me, but I had the pleasure of working with your dad for a good number of years and playing softball with your mom. I looked up your blog after seeing a reference in the latest publication of The Blue Dress Cookbook and just love what you are doing there. My passion away from real estate is learning how to grow better veggies in our raised beds and then turning them into some of my favorite Italian dishes, so what you’re doing really speaks to me 😉 Keep up the good work! Heaven knows the earth needs more friends, and we all love to eat great food…. Hi Peni! I’ve been meaning to reply to your kind note for far too long. Of course I remember you! So happy to hear you’re doing well and I’m delighted that you have discovered Happelsauce. I promise to post more recipes in the coming weeks. I’ve been slacking lately. Your favorite food suggestions and thoughts are welcomed!